We've had our first motorbike ride of the year. Our intention was to ride over the long Easter weekend, but what with rain forecast on Sunday and an exhausted DB, we decided to make it an afternoon on a sunny Saturday ride. In the end, we chose Uzès, named 'City of Art and History' in 2008, because it's lovely and gets packed during the tourist season, and we could pass through gorgeous little villages like Ste-Croix-de-Quintillargues on the way there. It has a rich history and a coal-mining tradition, the vestiges of which can still be seen, restored by the community. We continued our ride along the back roads to Sommières, another medieval pearl of Hérault, where we stopped for petrol. So far, my enjoyment of the ride had been somewhat marred by the niff of male cat-spotting pee. How on earth? you may wonder. Well, my dear little Ulysse, over winter and probably at Christmas when I dared to take leave of absence for a week (leaving my eldest for most of the days) undoubtedly took umbrage at my absence, and spotted one corner of the living room where my motorbike helmet sat. I had already discovered the evil evidence and dealt with the soggy box, but I had not sufficiently cleaned the helmet. For example, I had forgotten to clean the visor... So, when we stopped for petrol, I found a tissue in my pocket, got the bottle of San Pellegrino (sacrilege!) and tried to rectify the issues of visibility and pong. I succeeded with visibility, not so much with the pong, so had to keep the visor partly open for the rest of the ride. I admired the scenery and azure blue sky accompanied by the pungent odour of cat and tea tree oil (which I had optimistically used at home to try to neutralise the niffs). The Gard département is extremely varied in its geography. It ranges from the flat coastal plains of the Camargue and Nîmes to the mountains of the Cévennes. The roads to Uzès passed through the flatter plains, some of which were lined by plane trees growing at an angle, forced to struggle against the strong winds that regularly sweep over the region. The monotony of flatness and bare-branched vineyards was relieved occasionally by rocky outcrops, and in the far distance we could see just about make out the first mountains of the Cévennes, and snowy peaks. We reached Uzès, the first Duchy of France, at about 4pm and had a brief stop. It was a relief to remove my helmet which is very tight against my jaw and makes it ache after a while. Uzès was a Bishopric from the 5th century to the French Revolution. The Bishops of Uzès were very powerful. They had the right to mint coins, dispense justice and even bought part of the Uzès domain in the 13th century. There was continued rivalry between the Lords and Bishops, which resulted in various conflicts and lawsuits. 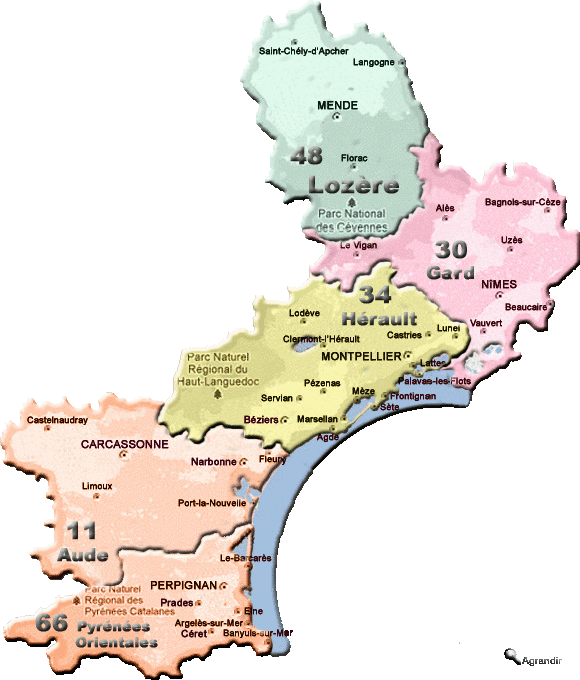 In the 18th century, the diocese of Uzès included 193 parishes and was one of the largest in the Languedoc. The main road circles around the town, so we did that because it's a very attractive place, and then left to go back home via Quissac. The views were similar to the ones earlier, but we did come across an extremely attractive domaine - Domaine de la Rouvière which I can't find on the map. There was no panel giving the name of the place either, only 'Private property, keep out' signposts. A welcoming bunch. I only know the name because there was a public right of way and a signpost giving the direction and distance of walks, marked 'Domaine de la Rouvière'. We didn't dawdle there as it was getting a bit chilly, but kept on and got home to a delicious glass of red wine and the end of the artisanal Turron, a toasted almond and egg-yolk sweet that my youngest brought back from his school trip to Valencia, Spain. My DB also found out, thanks to Google, how to remove the inside of my helmet so I could submerge it in a bucket of washing liquid and soak it all night. It is now pong-free. HURRAH! Yes, the little sod. I'm thinking of putting him in a cattery this summer. That'd teach him. Shame it's so pricey! We enjoyed our first trip, I must say. I'm glad you enjoyed our first trip out.